Captains of banking, industry and the superyachts in attendance at the inaugural Singapore Yacht Show gathered last night for an exclusive Gala Dinner at the Capella Hotel Singapore. 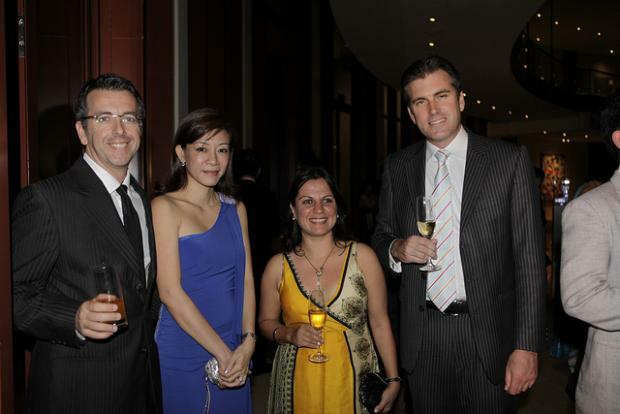 Held on Friday evening, 8 April 2011, the glamorous Gala Dinner represented the luxury and quality of the yachting lifestyle that is fast growing amongst Asia’s elite. Casino Resort Living was in attendance as guests enjoyed unique artwork from Lotus de Vivre, fine Italian wines, a sumptuous four-course meal, Remy Martin XO Cognac and lively entertainment. Guests from across the world gathered for a night to remember at the luxurious Capella Hotel Singapore and celebrate the inaugural Singapore Yacht Show. Captains of banking, industry and the who’s who of the global yachting industry where greeting on arrival by a stunning displays of the latest Rolls Royce Ghost and Phantom – living art works of hand crafted luxury. Waiters circulated amongst Asia’s elite with a selection of fine wines, champagne and canapés as the guests discussed the superyachts on display and the relative merits of Asia’s many cruising areas. The Rolls-Royce Motor Cars Singapore Cognac Bar also provided a quiet place for guest to relax and enjoy a warming snifter of fine Remy Martin XO Cognac. The circular Capella ballroom was beautifully decorated and filled to capacity for the invitation-only Gala Dinner hosted by Inform Yacht Group and the Singapore Yacht Show. Complimenting the dinner was a selection of Italian wines and French cognac. Rounding out the evening was an energetic performance by Singapore’s Urban Drum Crew. The inaugural Singapore Yacht Show Gala Dinner is the newest feature to Singapore’s social calendar, attracting Asia’s ultra wealthy, private bankers, captains of industry and yachting’s finest craftsmen. Casino Resort Living envisions robust growth in South East Asia’s yachting industry as new billionaires emerge in the region and changing lifestyles embrace the yachting lifestyle. Some of the finest superyachts already ply lesser known but remarkable diving grounds across the region and are ideal for charter for corporate entertainment and family vacations. The Singapore Yacht Show will surely grow and attract more superyachts to Singapore in years to come.